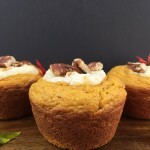 Delicious, protein packed Low Carb Pumpkin Cheesecake Muffins! Perfect for fall! Follow the instructions on the LC-Muffin Mix package adding the pumpkin puree and pumpkin pie spice. Fill greased muffin tin ⅔ of the way full. In a small bowl mix softened cream cheese, LC White Sugar Sweetener, and vanilla until smooth. Spoon a dollop of cream cheese on top of each muffin. Add pumpkin seeds or pecans, if desired.